Very green notes with smooth tobacco. Union and Confederate armies regularly traded tobacco for coffee and other goods throughout the Civil War. In Durham Station, North Carolina, near the end of the war, soldiers from both sides raided a farmer’s tobacco crop as they waited for a surrender to be completed. After returning home, these same soldiers wrote back to request more of this tobacco. The farmer, Mr. John Green, was happily obliged to send containers of “bright leaf” tobacco which reportedly had a much milder taste than the tobacco usually found. W.T. Blackwell partnered with Mr. Green and formed the “Bull Durham Tobacco Company”. The name “Bull Durham” is said to have been taken from the bull on the British Coleman Mustard, which Mr. Blackwell mistakenly believed was manufactured in Durham England. From 1874 – 1957, Bull Durham Tobacco, the first truly national tobacco brand, was manufactured in Durham, NC. Very green notes as if you were walking in through the brush and smooth tobacco. 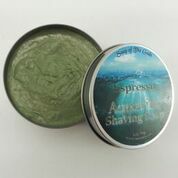 Make your shave the best by using only the finest oils & butters to leave your skin softer than when we first met. This soap is designed with the glide you need every time. Made with Stearic Acid, Aloe Vera, Coconut Fatty Acid, Castor, Glycerin, Potassium Hydroxide, Coconut-Babassu-Emu-Manteca-Olive-Argan-Abyssinian-Oils, Kokum-Cocoa-Butters, Calendula, Extracts, Poly Quats, Sodium Lactate, Allantoin, Silica, Liquid Silk,Tobacco Absolute, Bentonite Clay, and Fragrance.